University of Buckingham Press 2018, 124 pp., £7.99, p/b. Larry is a writer, physician and psychiatrist who was also one of the founding members of the Spirituality and Psychiatry special interest in the Royal College of Psychiatrists. In our time of disorientation and disconnection, he turns his attention to the tension between worldly and spiritual values within an overall developmental framework. The first part of this inspiring book spells out the rationale and a path towards spiritual maturity, also including valuable ideas on loss and growth, left and right hemisphere thinking, and the search for the true self. The overall direction is from conformity to independence and responsibility, leading ultimately to a compassionate and universal outlook. The second part presents a wisdom view on politics, religion, education, mental health, capitalism and art, with many valuable insights. The third part offers advice on spiritual practices and the realisation, influenced by Thomas Merton, that we are already one. Individually, this means engaging with the challenges of living, growing, healing and ultimately surrendering all our attachments ‘while experiencing oneself is seamlessly connected to the whole, to everyone else, to nature and the fullness of creation.’ The book ends with an appeal for readers to take a personal stock of priorities and values and to become committed wisdom seekers while living a balanced, responsible and compassionate life. To the extent that we respond, we are contributing to co-creating a better future for ourselves and the world. In that sense, the book is a significant source of hope at a time when it is easy to despair. 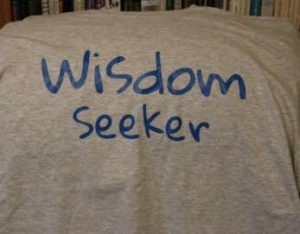 Larry has posted a 12 minute YouTube video about his book ‘Seeking Wisdom’.